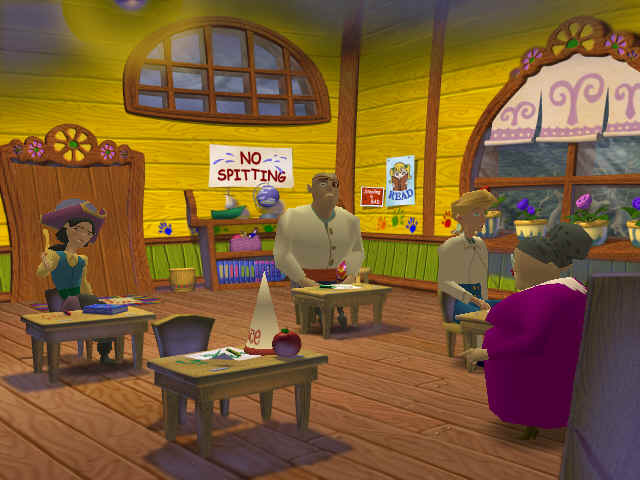 Escape From Monkey Island is the first Monkey Island release to switch to 3D, that is to say all the characters are in 3D while the backgrounds are pre-rendered. 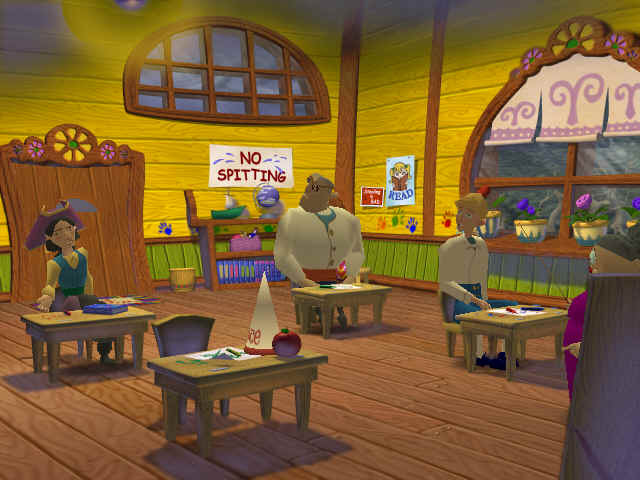 The first LucasArts adventure to use this type of 3D style was Grim Fandango, and although the gameplay was very good (and wonderfully original) the controls left a lot to be desired. So the game now requires a 3D accelerator compared to the previous three games. 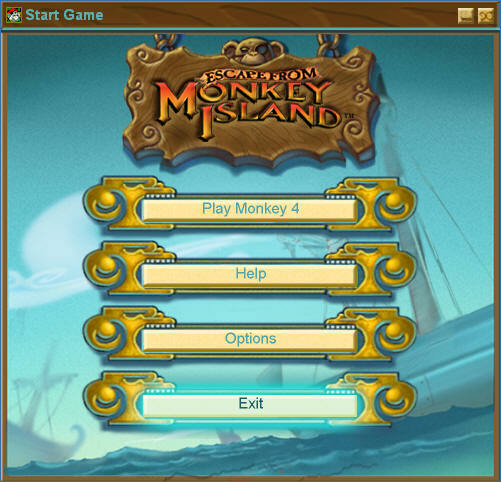 Escape From Monkey Island comes on 2 CD's, and the installation ranges from 150mbs to 900+. I went with the typical installation which meant just 150mbs of space was used on my hard drive. The game doesn't have a great need to fiddle about with any settings as the game is basically ready to go straight away as there is only one resolution to choose from. 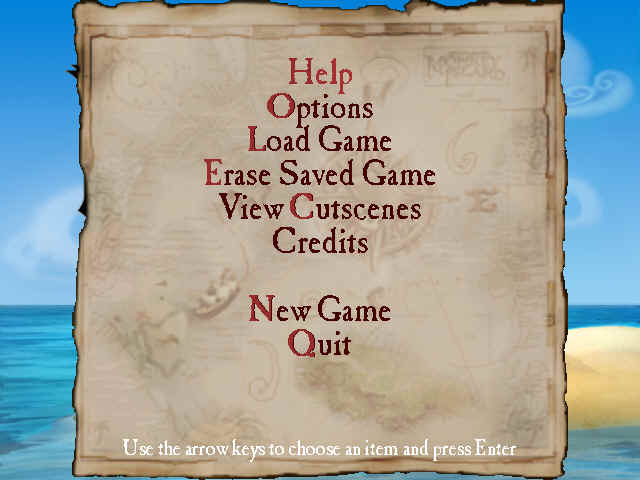 "The main disappointments on the graphic side are the fact that the cutscenes are not done with the in-game engine"
If you have played the previous Monkey Island games then you'll know exactly what Escape From Monkey Island is all about. This time around Guybrush and Elaine have finally married each other and hope they can leave the bad times with Le Chuck in the past. But not everything goes to plan as they return from their Honeymoon to discover that Elaine has been declared and a new governor for the island must be elected. 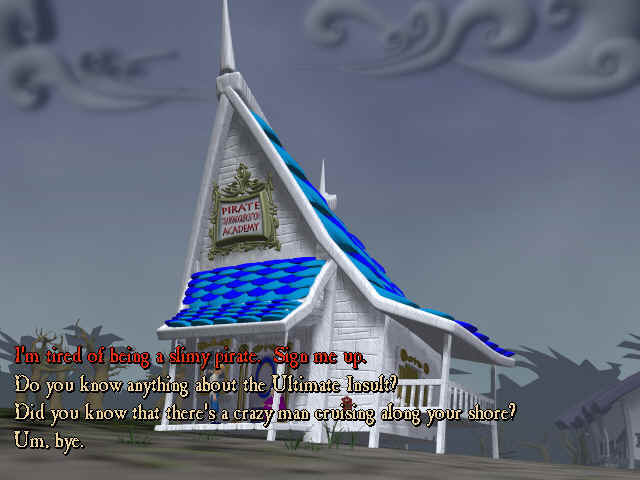 The basic premise of the Monkey Island games is still here in Escape From Monkey Island. While the point and click interface has now gone we are presented with the new Grim Fandango style interface which is completely keyboard or joystick controlled. 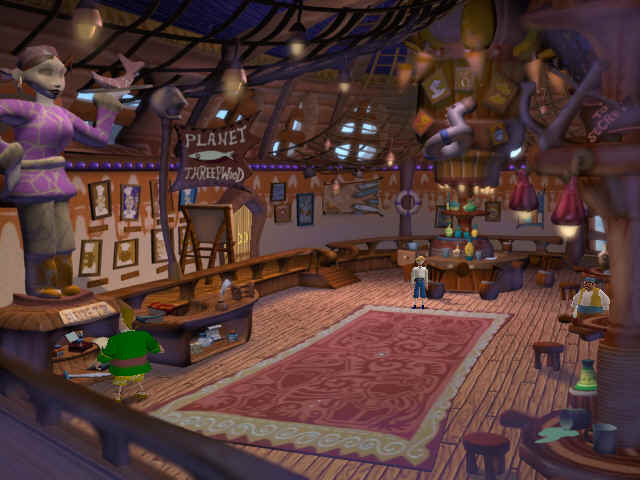 Moving Guybrush around the screen is quite easy to do and doesn't take too long to get used to even if you are still used to using the mouse to move the characters around. As you move around the screen Guybrush will look at objects or characters that he can interact with, it works really well. 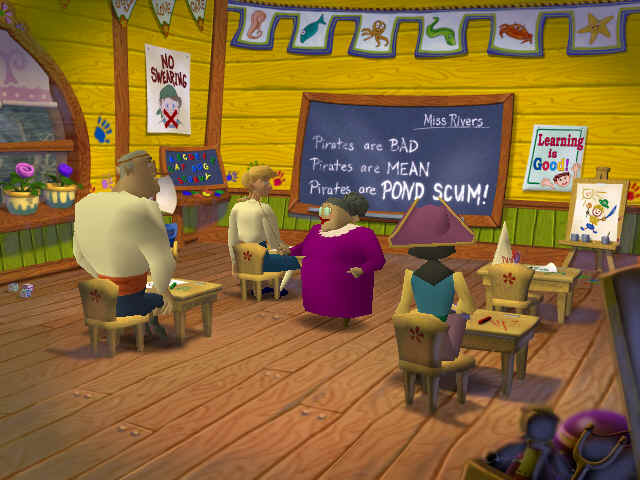 The gameplay hasn't changed from Monkey Island to Escape From Monkey Island one bit, you are still required to speak to characters (with 2CD's chock full of speech), use and combine objects and discover new places. 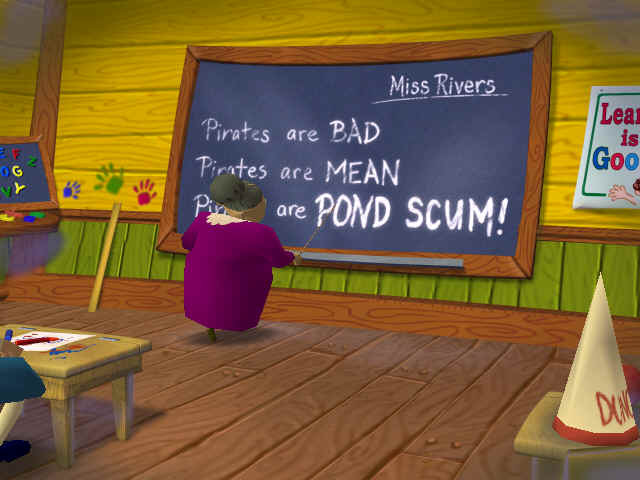 The main change in Escape from Monkey Island apart from the obvious graphical differences is the increase in good jokes compared to the previous release Curse Of Monkey Island and this is mainly due to the guys who created the excellent (and still probably funniest game created) Sam and Max being the main people behind it. 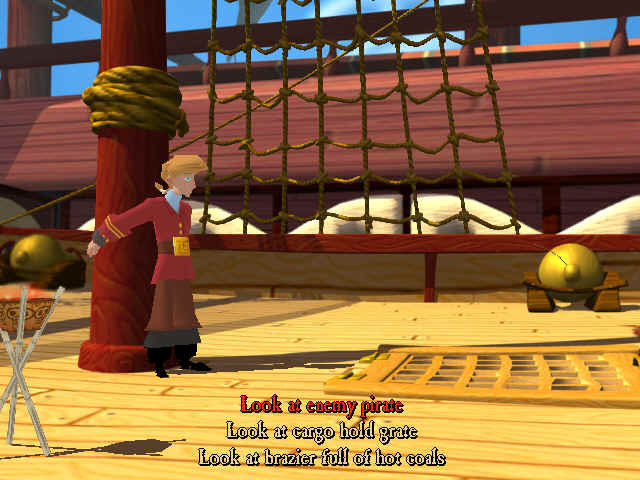 As I have mentioned a few times throughout the review, Escape From Monkey Island does away with the flat 2D graphics from the previous three Monkey Island games and brings in a new 3D look to the series, thankfully though the warmth of the characters managed to come through just as well in this new release as it did in the previous game The Curse Of Monkey Island which was and still is a beautiful game to look at and play. 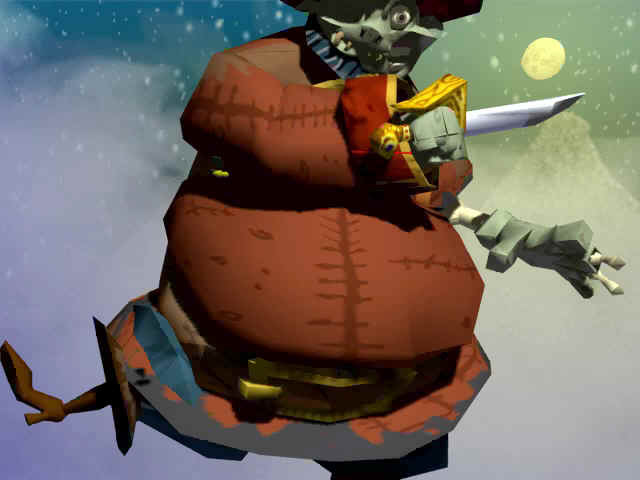 The main disappointments on the graphic side are the fact that the cutscenes are not done with the in-game engine but by full motion video which although fun to watch, would be even better if done via the engine and the final and worst part altogether the rather high amount of jaggies (due to you only being able to play in 640x480) that infest the game. Soundwise you can never fault Lucasarts games, it is superb all the way through with bucket loads of dialogue squeezed onto the two CD's. 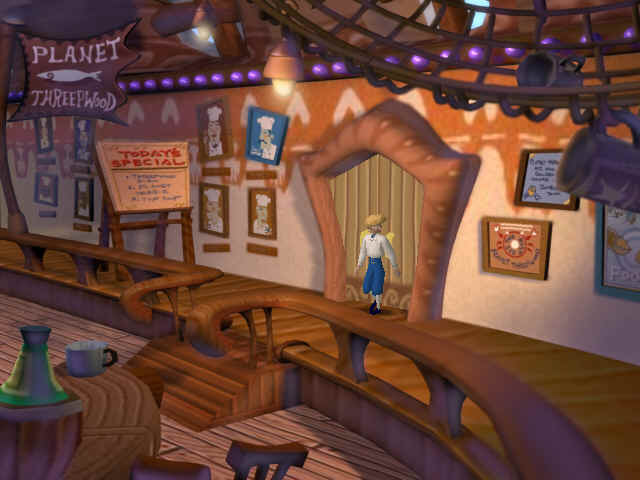 Musically Escape From Monkey Island has hardly changed from the last Monkey Island release, but then again it didn't really have to as there was nothing wrong with the music in Curse Of Monkey Island to warrant a change.